So you’ve finally convinced your spouse that it’s time for a kitchen upgrade. That’s great! Now that you’ve got the hardest part out of the way, it’s time to start working on the specifics…like the color scheme and what kind of cabinets you want to install. While you can definitely find stock cabinets that will do, it’s worth taking the extra time to consider installing custom cabinets instead. They may cost more, but you’ll likely find that the benefits greatly outweigh the higher price tag. 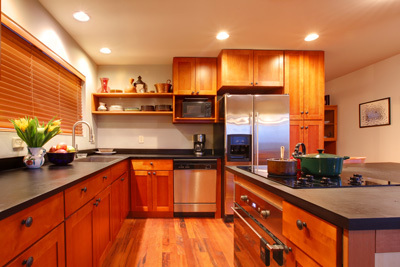 Here are 3 great reasons that you should choose custom kitchen cabinets for your remodel. Have more pots and pans than coffee mugs? Or maybe you need more counter space and fewer drawers? You got it! One of the biggest benefits to choosing custom cabinets for your kitchen or bathroom remodel is that you have the ability to personalize your space. You can even adjust the height of the cabinets you install, giving you ultimate control over your new kitchen. Some houses just have funky layouts. There’s nothing wrong with this, but it can cause a bit of a headache for contractors when installing stock cabinetry. If the floorplan is too unusual, your first-choice stock cabinets may simply be out of the question. Custom cabinetry ensures that your new cabinets will fit perfectly into your space, no matter how unique your kitchen floorplan is. If you’re going to do something, you should do it right. While stock cabinets will certainly do the trick, custom cabinets are handmade by professionals who make a career out of providing quality products to customers. Stock cabinets, on the other hand, are usually made by factory workers more interested in their next paycheck than how long your cabinets will last. Need a reliable contractor to help you choose and install the custom kitchen cabinets of your dreams? Contact Gem Qualities Contractors and Services today! Visit our website for more information about our company and the services we offer or call (206) 557–6509 today to speak with one of our helpful home remodeling representatives. Posted on April 28, 2016 under in Remodeling Advice | By Geoff. We are here to help. Call (206) 557-6509 or email us at info@gemqualities.com. Copyright © 2019 Gem Qualities Contractors and Services All Rights Reserved.